PDF (Portable Document Format) files are (in many respects) perfect for exchanging documents that don’t need to be changed after the fact. Hence, often it makes sense to export PDF files from Microsoft Office (e.g. Word or PowerPoint) in order to make them available for others. Just think of presentation slides or handouts that you want to put online. Unfortunately, the default settings of Microsoft Office (as far as I know in all versions) produce rather unimpressive results when it comes to images. 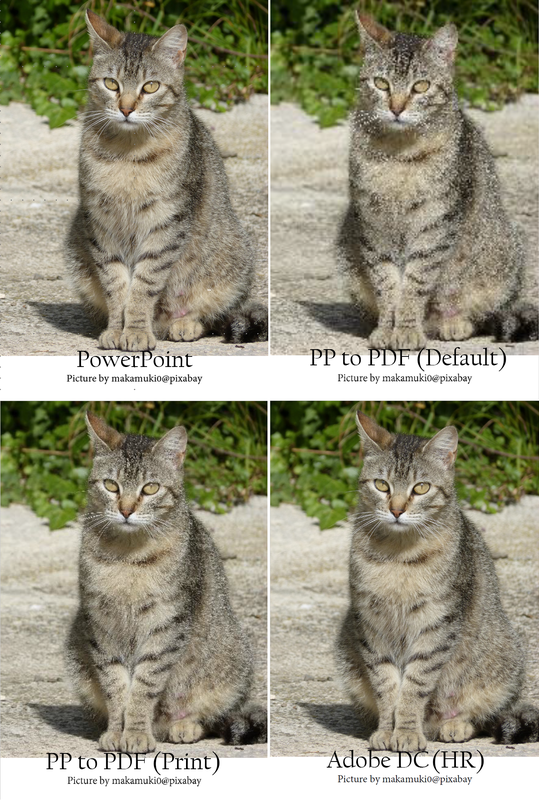 The following example shows exported PDF versions of a cat photograph with various settings. The top left image is a screenshot directly from PowerPoint 2016. 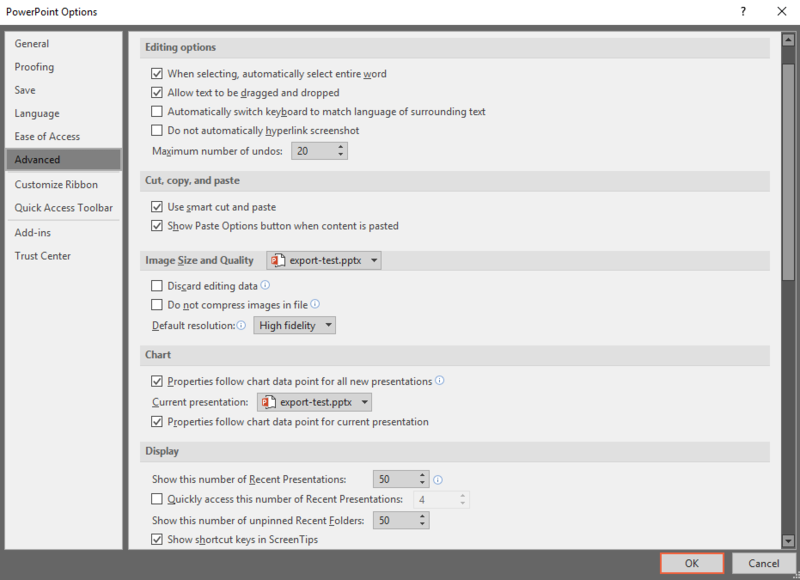 On the top right, we can see a PDF export from PowerPoint with default settings. As you can see, this is rather terrible. Often, especially with smaller logos or background images, the compression artifacts are hard to spot on first glance. However, once you’ve spotted them, they really spoil an otherwise beautiful PDF export. The bottom left and right examples are exports from PowerPoint 2016 (print settings) and Adobe Acrobat DC respectively. If file size (high fidelity PDFs are much larger) is not really an issue for you, it seems reasonable to just change the defaults setting in PowerPoint and Word. This can be done in the Office options menu. Unfortunately, you have to do this for all Office products individually. In the following example, I have changed the default resolution to ‘High fidelity’ - the highest setting available. This alone will drastically improve the quality of your PDF files. If you choose to select ‘Do not compress image files’, Office will ignore the ‘default resolution’ and just use the original images file’s resolution. However, while both the print version and the Adobe version look fine, Adobe Acrobat handles such things as transparency much better. If you are working with complex images, transparent images, or extremely large files, Adobe Acrobat (DC) is generally advisable - despite its high cost. In this regard it is important to note that the newer versions of Microsoft Office, such as 2016, are only really compatible with the DC version of Acrobat, not X or XI. The last important thing to remember is that the PDF/A format (designed for long-term archival) is not compatible with transparent images. If you export those using PDF/A settings, they will just appear slightly darker than the original transparent one. 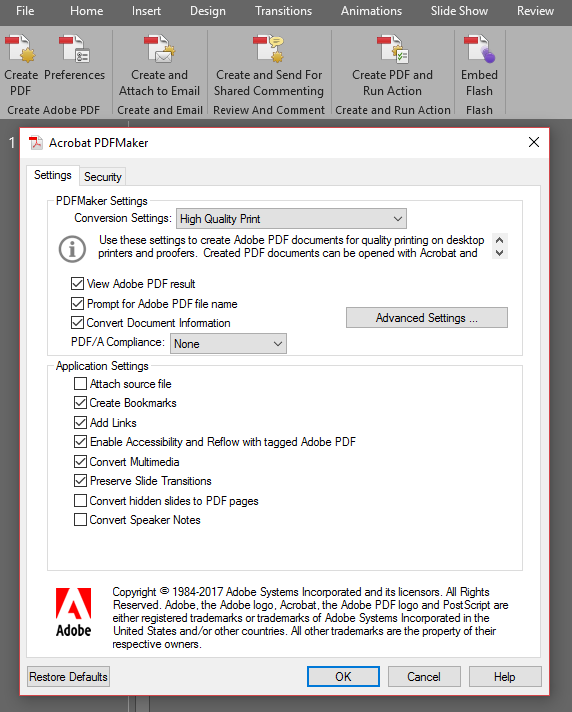 If you cannot (or don’t want to) afford Adobe Acrobat, there are various PDF printer drivers that can be used to create PDFs from anything that can be printed. They often support more features than the plain Microsoft Office export module. The most prominent one probably is pdfforge’s PDFCreator. It’s free and also (for the most part) open source. However, the software has received some criticism for including unwanted software (and even malware) in their installer. While this seems to have been resolved, be careful! On a Mac (and Windows), the same thing should work with soffice instead of oflibreoffice.